2 Daily Science pg. 48 Name the two main types of waves. What are the two sub categories of waves? Draw the two types of waves and label the parts in each. What is the equation for speed? What is the unit for speed? 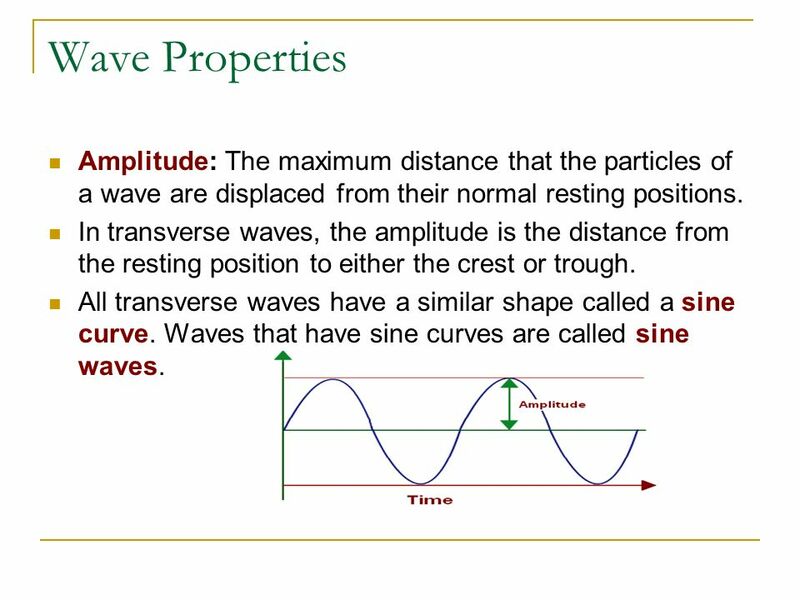 3 Wave Properties Amplitude: The maximum distance that the particles of a wave are displaced from their normal resting positions. In transverse waves, the amplitude is the distance from the resting position to either the crest or trough. All transverse waves have a similar shape called a sine curve. Waves that have sine curves are called sine waves. 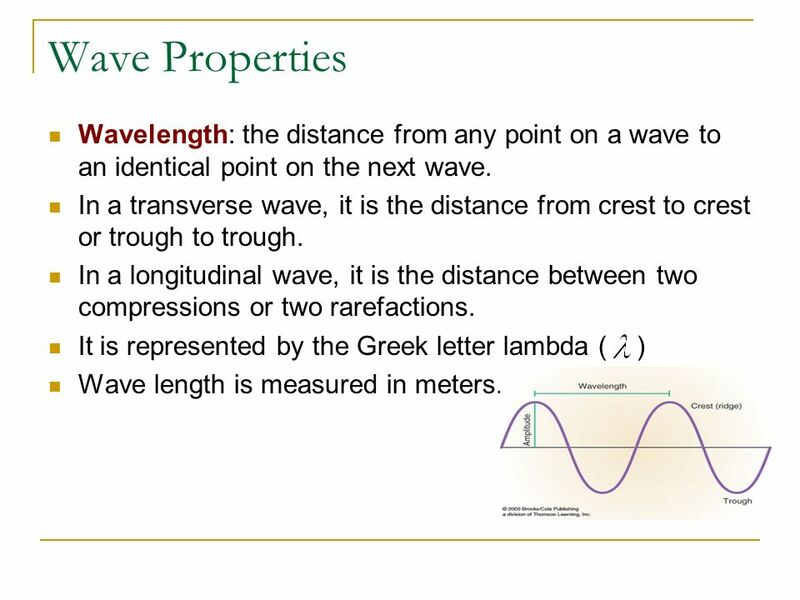 4 Wave Properties Wavelength: the distance from any point on a wave to an identical point on the next wave. In a transverse wave, it is the distance from crest to crest or trough to trough. In a longitudinal wave, it is the distance between two compressions or two rarefactions. It is represented by the Greek letter lambda ( ) Wave length is measured in meters. 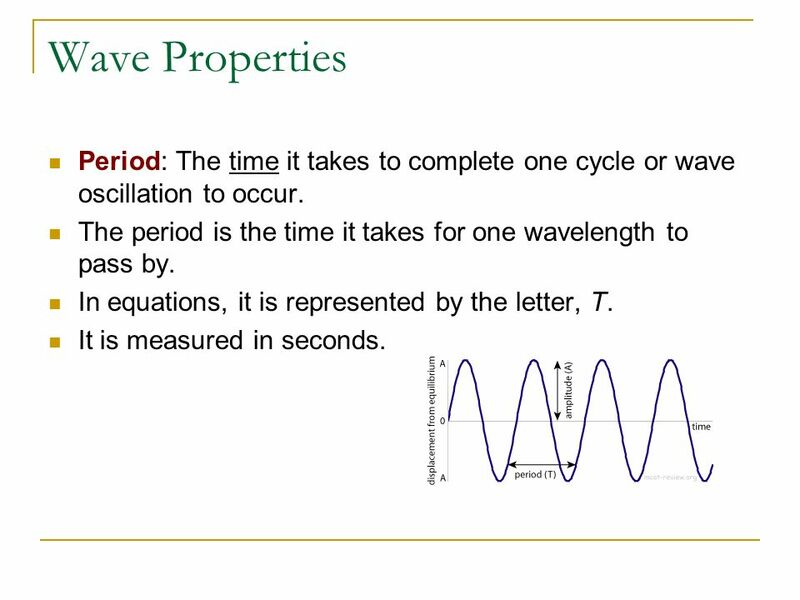 6 Wave Properties Period: The time it takes to complete one cycle or wave oscillation to occur. The period is the time it takes for one wavelength to pass by. In equations, it is represented by the letter, T. It is measured in seconds. a point in a given time interval. 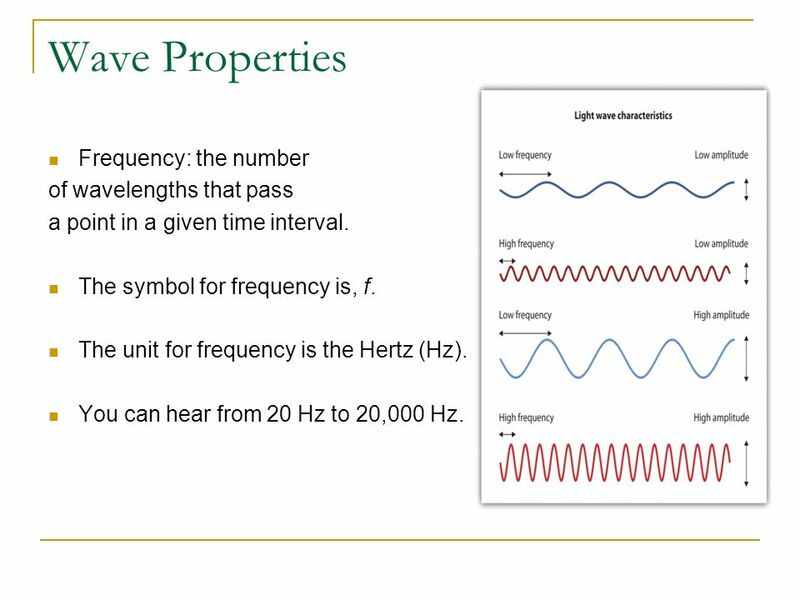 The symbol for frequency is, f. The unit for frequency is the Hertz (Hz). You can hear from 20 Hz to 20,000 Hz. 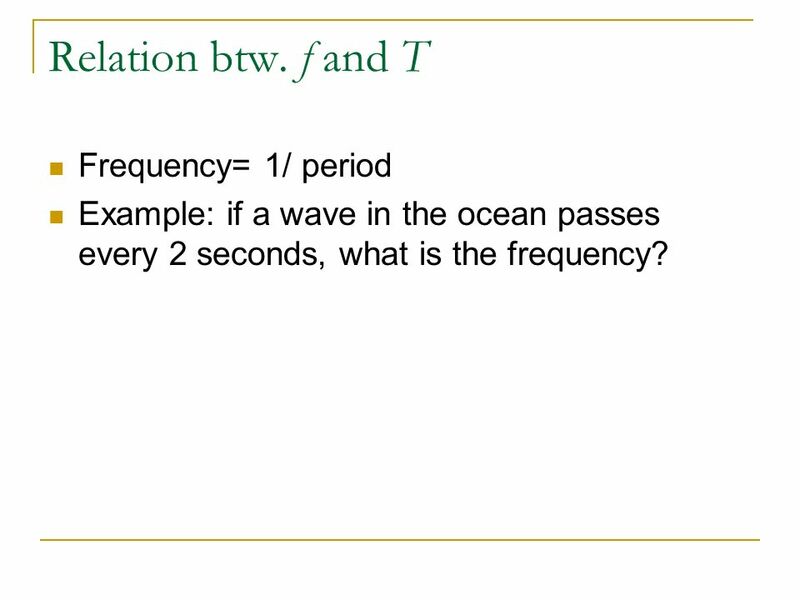 Example: if a wave in the ocean passes every 2 seconds, what is the frequency? 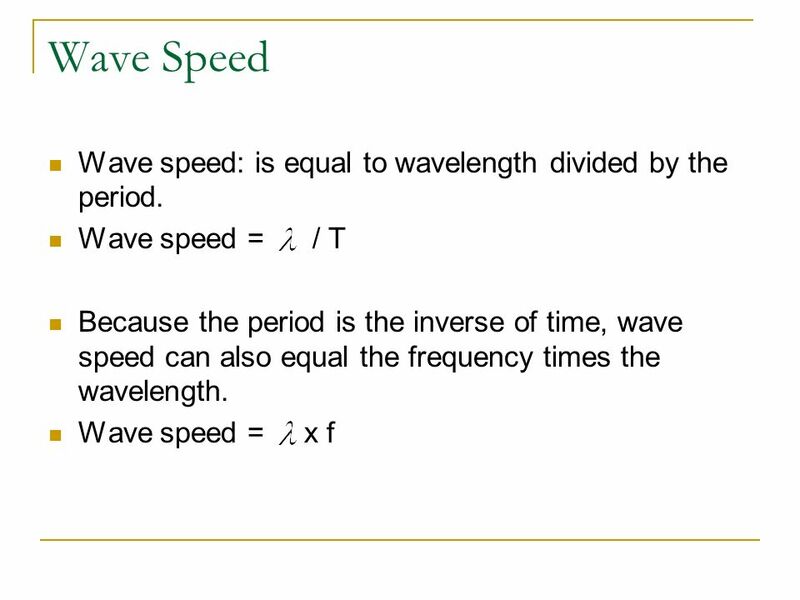 9 Wave Speed Wave speed: is equal to wavelength divided by the period. 10 Examples The average wavelength in a series of ocean waves is 15 m. A wave crest arrives at the shore every 10 seconds, so the frequency is 0.1 Hz. What is the average speed of the waves. Green light has a wavelength of 5.20 x 10-7 m. The speed of light is 3.00 x 10 8 m/s. 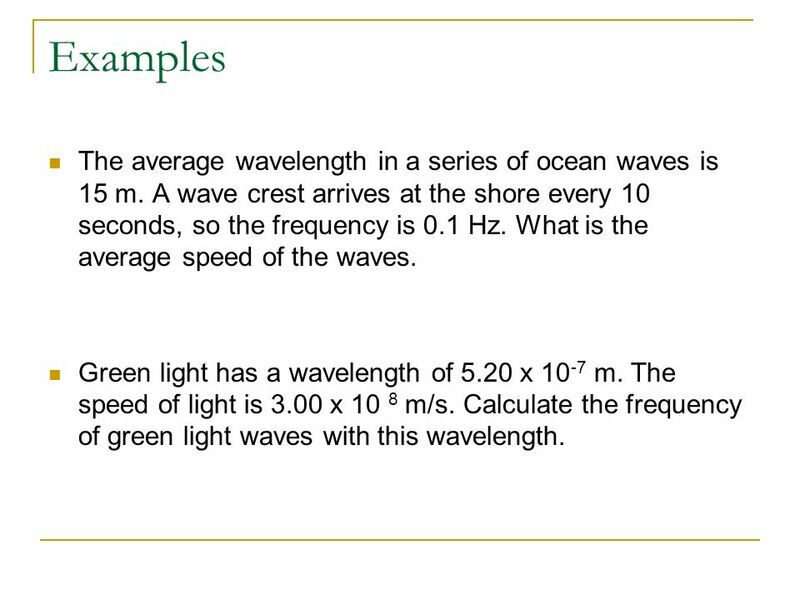 Calculate the frequency of green light waves with this wavelength. Sound waves travel faster in solids than they do in air. Waves travel differently in liquids, solids and gasses because of the arrangement of the particles. 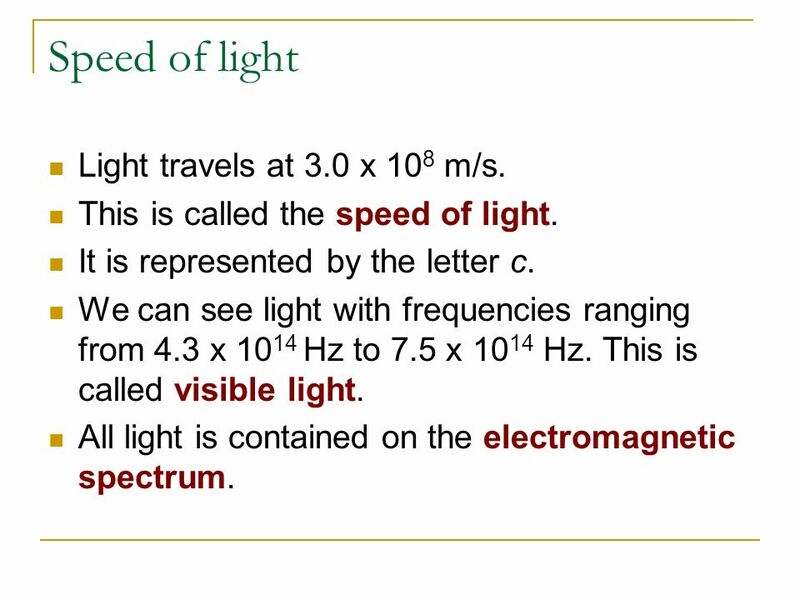 12 Speed of light Light travels at 3.0 x 108 m/s. This is called the speed of light. It is represented by the letter c. We can see light with frequencies ranging from 4.3 x 1014 Hz to 7.5 x 1014 Hz. This is called visible light. All light is contained on the electromagnetic spectrum. 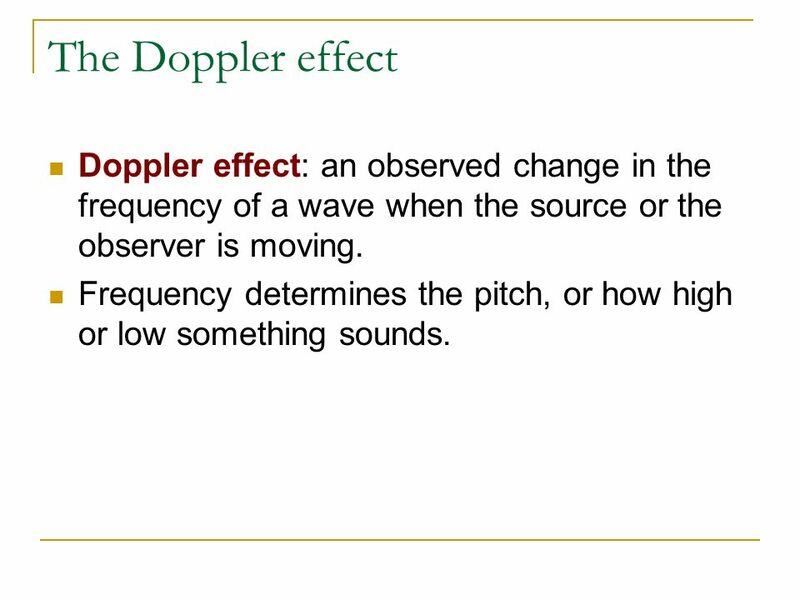 13 The Doppler effect Doppler effect: an observed change in the frequency of a wave when the source or the observer is moving. Frequency determines the pitch, or how high or low something sounds. 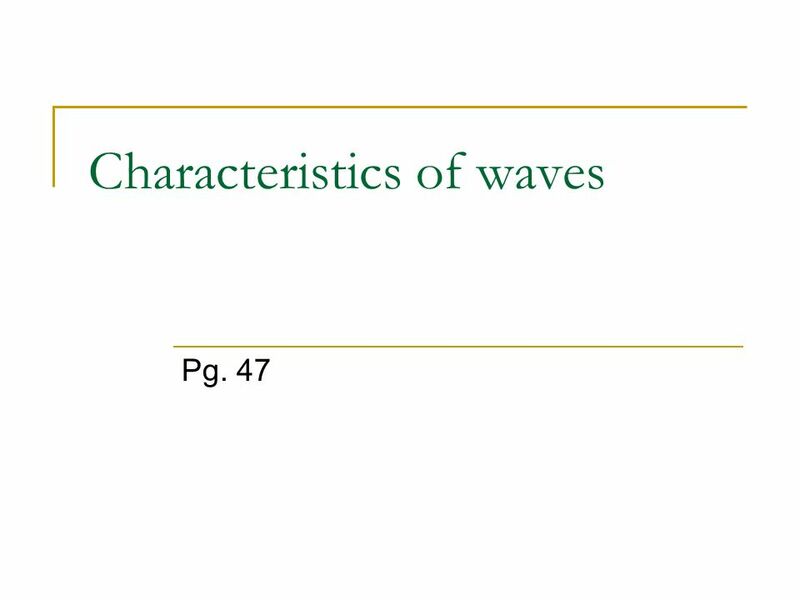 Download ppt "Characteristics of waves"
Ch. 25 Waves HW 1-16. Waves/Sound. The Nature of Waves What is a wave? –A wave is a repeating ____________ or ____________ that transfers _________ through ________or_________. Waves Students will learn about waves. Waves Waves transfer energy without the transfer of mass. A wave is a vibratory disturbance that is transmitted. 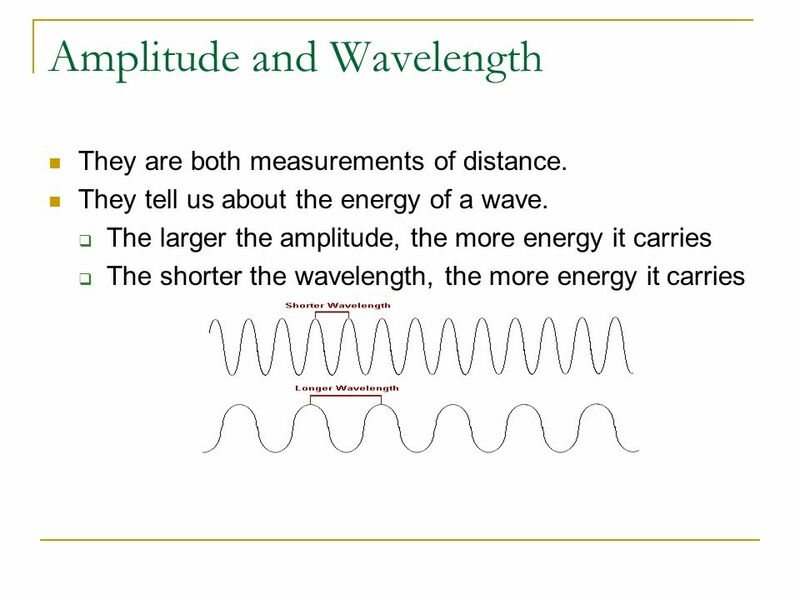 Learning Goals: Define wavelength, frequency, period, and amplitude. Describe the relationship between frequency and wavelength. Explain how a wave’s energy. Mechanical Waves Types of Wave Describing Waves The Wave Equation. 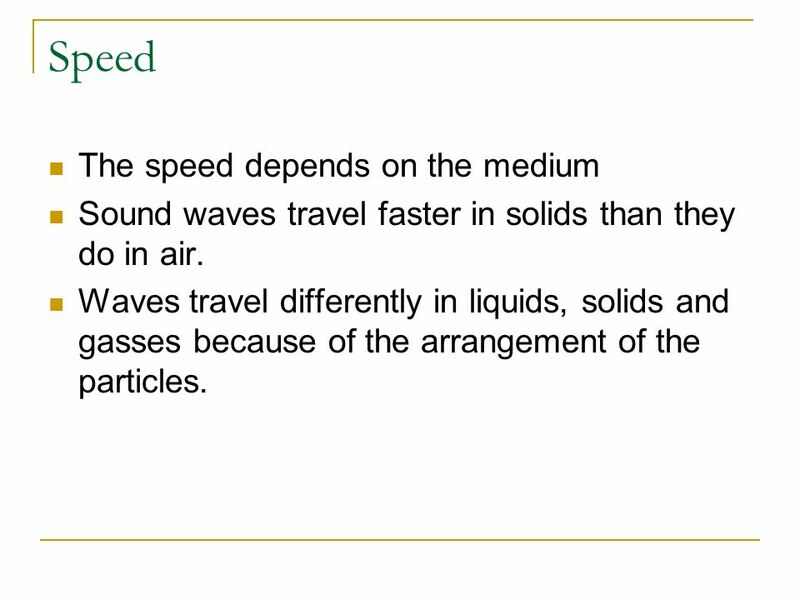 WAVE UNIT: SECTION 2 NOTES Characteristics of Waves. Chapter 11 Waves and Wave properties. What is a wave? A wave is a disturbance that carries energy through matter or space. Warm Up What is a wave? Name all the parts of a wave you can think of Name all the different kinds of waves you can think of. By Aimee Chavez. Wave: a disturbance that transfers energy from place to place. The material through which a wave travels through is called a medium. WAVES PROPERTIES Chapter 11, Section 3. What is a wave? A wave is a disturbance that carries energy through matter or space. 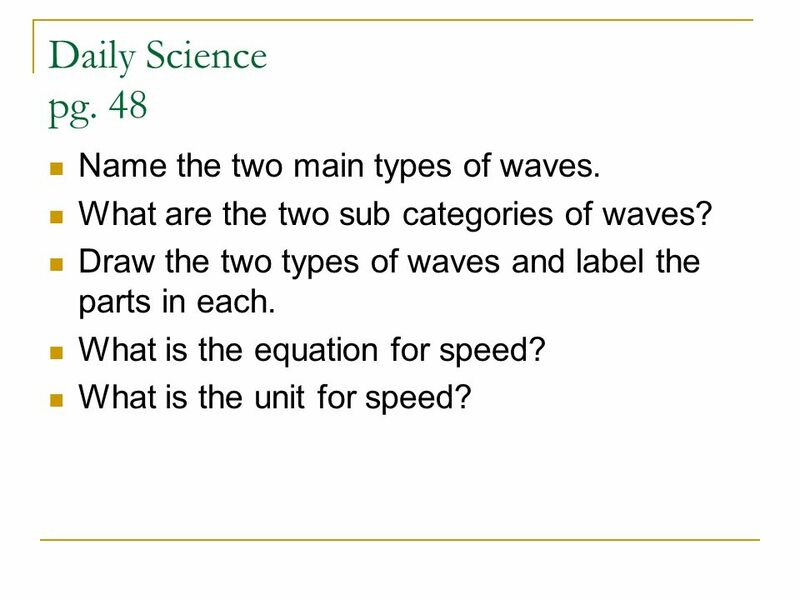 WavesSection 2 Section 2: Characteristics of Waves Preview Key Ideas Bellringer Wave Properties Wave Speed Math Skills.